When the news on Twitter broke this morning that Ball State had hired a new Athletic Director, to say I was taking it with a grain of salt was an understatement. There had been a bevy of names thrown around by the various folks and even a few messages with the phrase “done deal” in it. So when Doug Zaleski of the Star Press broke the news that Bill Scholl was the new Athletic Director, I was skeptical. At today’s press conference though, President Gora confirmed what Zaleski broke and introduced Bill Scholl to Cardinal Nation. MUNCIE, Ind. 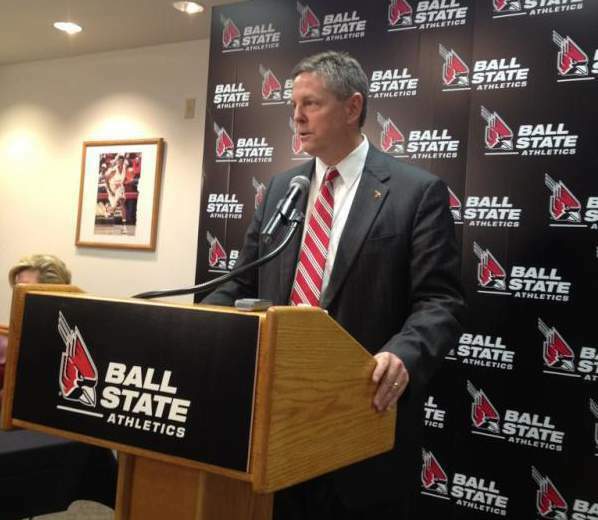 — Ball State President Jo Ann M. Gora today announced her appointment of Bill Scholl as director of intercollegiate athletics. Scholl brings to Ball State more than two decades of athletics administration experience at the University of Notre Dame. As deputy athletic director, he has been responsible for supervision of sports such as football, men’s basketball, baseball and men’s soccer. He is responsible for senior-level administration such as fundraising and donor relations, divisional budget construction and growing external revenue. An example of Scholl’s major accomplishments at Notre Dame is working side-by-side with baseball head coach Paul Mainieri to grow the program into a destination for baseball talent in the northern U.S. The team earned its first trip to the College World Series in 2002 — the first time in 45 years — and won nine conference titles. Mainieri is now head coach at national powerhouse Louisiana State University. One of Scholl’s first assignments was raising the visibility and stature of the women’s basketball program. In 1989, the team suffered from a limited fan base. Today, the team routinely ranks in the top 10 in the NCAA for attendance. The team rose to the final game of the NCAA tournament this year, falling only to undefeated Baylor. Scholl also led an $84 million athletics fundraising initiative for the Spirit of Notre Dame campaign. With coaches, he has managed issues of compliance, budgets, scheduling, media strategy and recruitment. Gora thanked the search committee members for their commitment and thoroughness as well as their thoughtful deliberations. With their help, the search attracted more than 90 candidates and concluded more than two months ahead of the university’s initial deadline of July 1. “I was very impressed with the thoroughness and thoughtfulness of the search committee,” said the Honorable Marianne Vorhees, Delaware County Circuit Court judge. “Each applicant received full consideration on the many aspects of success required of a complex and demanding position. The community will find Bill an unassuming yet confident and expert leader. He will be great not only for Ball State but for our community.” Vorhees is a Ball State alumna and played on the women’s softball team as a student-athlete. Bill and his wife, Julie Scholl, have three children, Michael, Stefanie and Kelly. Stefanie is a Ball State senior and will graduate in May. Michael is a Notre Dame alumnus and works in the athletics department of Vanderbilt University, and Kelly is a sophomore at Notre Dame. Scholl will start at Ball State University on April 30, 2012. I think Scholl brings a wealth of talent to the job and expertise and experience in areas that I, and many others, would consider critical for BSU Athletics. The areas of fundraising and program building are two particular areas that fans have been grumbling about for a while now. Whether or not Scholl can have the same sort of results on the comparatively pauper-esque budget at BSU remains to be seen, but all signs point to if there was a way to do it, he’d find it. This site and its leadership have often been critical about the institutional approach to athletics and whether or not it was a priority. For now at least, it appears that it is, otherwise they wouldn’t have hired an Athletic Director with such zest and passion for the areas that demonstrate that priority. Perhaps what was most noticeable, at least for me, was the general tone, demeanor, and confidence from Scholl at the podium. I never got that feeling of happiness or excitement from Collins the few times I spotted him at games or postgames. He always just seemed like someone riding out a bumpy ride… one that came to a close today. Scholl will be replacing Collins effective April 30, which is considerably sooner than the end of Collins’ contract on June 30. What that means in terms of Collins’ role in the department wasn’t addressed at the press conference, but I would think it’s pretty safe to say that Collins only has the keys to this car for the next two weeks. And in some ways, I would imagine he’s pretty ok with that. Scholl’s bio from Notre Dame..
Bill Scholl is in his third year as deputy director of athletics at his alma mater, the University of Notre Dame. He works with the Irish football squad on a daily basis from an administrative standpoint, working in concert with athletics director Jack Swarbrick in that regard. Serving as one of the department’s two deputy directors, Scholl focuses his attention on external functions such as development, the Team Notre Dame program, marketing and ticketing operations. Among those areas reporting to Scholl is the newly created position designed to manage the department’s relationship with former student-athletes. A 22-year veteran of the Notre Dame athletics department, Bill Scholl was promoted to senior associate athletics director in October 2004. His primary duties in that role included the creation, coordination, management and implementation of all annual, endowment, and capital development activities on behalf of the athletics department in alignment with the University’s central development office. In coordination with the central development office, Scholl oversees the Rockne Heritage Fund — the first-ever athletics annual fund that directly benefits student-athlete grant-in-aid scholarships. This is in support of the University’s scholarship implementation plan that now offers the full NCAA complement (more than 320) grant-in-aid scholarships to Irish student-athletes in all 26 varsity sports. Prior to his position as senior associate athletics director, Scholl spent three years as the associate athletics director for marketing and was executive director of the Notre Dame Monogram Club, an organization of Notre Dame student-athletes, student managers and cheerleaders who have earned monograms during their years at Notre Dame through participation in one or more of its intercollegiate sports. In addition, Scholl oversaw all aspects of the athletics ticket office, including ticketing, parking, staffing, systems and customer relations. His previous sport administration duties included providing supervision for the men’s soccer as well as assisting the director of athletics with the men’s basketball program. Prior to being named an associate athletic director and the executive director of the Monogram Club, Scholl served seven years as an assistant athletic director for marketing, overseeing the Notre Dame marketing and promotions programs. As the promotions manager at Notre Dame, he greatly expanded the horizons of Notre Dame’s Olympic sports profile. Scholl was responsible for developing and implementing marketing and promotions plans for all athletic events. His activities included coordinating special events, giveaways, clinics, group nights and other general functions that broadened the community’s awareness of Notre Dame’s Olympic sports. The former director of financial development for the 1987 International Summer Special Olympic Games, Scholl served in the same position for one year at South Bend’s Logan Center which offers services to persons with developmental disabilities. He also spent five years with the Juhl Advertising Agency in Mishawaka, Ind. While working for Special Olympics, the Lakewood, Ohio, native was responsible for raising a $4.8 million budget from national and local corporations, foundations, governments, special events and the general public. Through his efforts, the final amount raised for the `87 Games was in excess of $8 million. In June 2000, the Notre Dame Monogram Club awarded him an honorary monogram. Born Sept. 2, 1957, Scholl is a 1979 Notre Dame graduate. He and his wife, Julie, have three children: Michael (a 2009 Notre Dame graduate), Stefanie (a senior at Ball State University) and Kelly (a sophomore at Notre Dame). Welcome to Bill Scholl and let’s all hope this is the leap in the right direction I’m expecting it to be.